The Associated Equipment Company was a British vehicle manufacturer that built buses, coaches and lorries between 1912 and 1979 under the AEC brand name (and ACLO in Latin America). They produced military vehicles during World War Two and, in 1946, formed British United Traction Ltd (BUT) as a joint venture with Leyland to manufacture trolleybuses and traction equipment for diesel railcars. In 1948 AEC acquired Crossley Motors and the Maudslay Motor Company, setting up ACV (Associated Commercial Vehicles) Ltd. as the holding company. ACV was taken over by Leyland Motors Ltd in 1962. All AEC double-decker buses ceased production in 1968 and its last buses, coaches and lorries were made in 1979. The company is most famously associated with the iconic Sixties 'Routemaster' double-decker bus. Seddon Atkinson Vehicles Limited is a British manufacturer of large haulage vehicles formed in 1970 when Seddon Diesel Vehicles Limited of Oldham acquired Atkinson Vehicles Limited of Preston, who were founded in 1907 and originally manufactured and repaired steam wagons. Seddon were a commercial vehicle producer who assembled vehicles from bought-in proprietary components. Robert and Herbert Seddon were the sons of a Salford butcher who, just after the First World War in 1919, used a Commer with both van and charabanc bodies to transport goods during the week and run excursion tours at the weekends in partnership with a dairy man called Foster. As 'Foster & Seddon' they expanded into the reconditioning of old vehicles and held an agency for Morris Motors vehicles. They also, originally, ran a bus service between Swinton and Salford which they subsequently sold off to Salford Corporation. In 1937 Robert Seddon began designing and building commercial diesel-engined lorries, manufactured from proprietary units, to address an identified 'gap' in the vehicle market. Bedford (Vehicles) was a brand produced by Vauxhall Motors. The Bedford TK range was produced in large numbers from 1959 and it formed the basis for a wide variety of derivatives including fire engines, military vehicles, horse-boxes, tippers, flat-beds and many specialist utility vehicles. A British Post Office (British Telecom) version known as 'The Polecat' was used for the installation of telegraph poles and the British Armed Forces still use another variant, the 4-wheel drive Bedford MKs. Foden Trucks was a British company founded in 1856, in Sandbach, Cheshire, by Edwin Foden, manufacturing steam-powered vehicles. Differences of opinion within the company resulted in Edwin, and his son Dennis, being 'fired' by the directors, most of whom were family members. 'Paid off', with an agreement not to partake in the building of commercial vehicles, Edwin relocated to Lancashire. In 1933, his son Dennis started his own engineering company near the Foden works, manufacturing both the cabs and the chassis of his own Gardner diesel-powered vehicles. In honour of his father, Edwin Richard Foden, the company was named ERF Ltd and the company expanded rapidly, gaining partnerships with Gardner and Perkins for the supply of power units. ERF was bought by Canadian truck manufacturer Western Star in 1996, closing its Sandbach factory in 2002. Competitive pressure, brought about by PACCAR's purchases of Foden, DAF Trucks and Leyland Trucks influenced their decision to sell ERF to MAN AG in 2007 and the use of the ERF marque name finally ceased. Foden was acquired by PACCAR (producers of American 'Kenworth' trucks) in 1980 and the marque name ceased to be in use after 2006. Guy Motors was a vehicle manufacturer, based in Wolverhampton, that produced cars, lorries, buses and trolleybuses. Founded in 1914 by Sydney S. Guy, it operated out of its Fallings Park factory from 1914 to 1982. Although new designs were being produced and performing well, the company were in financial trouble by 1960 and entered into receivership in 1961, when they were acquired by Sir William Lyons, managing director of Jaguar, who transferred all its assets to a new company, Guy Motors (Europe) Limited. They continued to be successful throughout the 1960s but the series of mergers (see timeline) that ultimately ended with the formation of the British Leyland Motor Corporation in 1968 resulted in Leyland ceasing the production of Guy-badged buses in 1972. Due to the success of its 'Big J' range, Guy Motors was one of the few companies owned by BLMC operating at a profit but, despite this, Leyland decided to close the Fallings Park plant in August 1982 as part of their business rationalisation. Following the 1952 merger of Morris and Austin, BMC rationalised its van range by concentrating on the Morris models but, to keep their Austin and Morris dealer chains separate, certain vans were offered under both marques with different badges and grilles. The Morris LD series produced between 1952 and 1968 offered a 1.0 or 1.5 ton capacity, with wide rear doors, sliding front doors and a low floor which was very popular. The next generation saw the introduction of the Morris J2, in 1956, which was Britain's first fully forward-control compact van. With a 1489cc engine, column gear change and pressed steel cab seats, the total number produced was 160,000, including the minibus and pick-up configurations which, together with the Austin 152 Omnivan version, were in production until 1967 and was BMC's main challenge to Bedford's market leader, the CA. The CA Series, the van of choice' for newspaper delivery agents and local traders, was a semi-forward control van offered in 10/12cwt and 15cwt models for both short and long wheelbases and was produced between 1952 and 1969 by the Vauxhall subsidiary.The pug-nosed vehicle was usually supplied complete, as a light delivery van with sliding doors, but was also available as a chassis to which specialist bodywork could be added. One example of this was the Bedford Dormobile, a campervan conversion built on the CA chassis. Rootes Group entered the 15cwt class arena in 1958 with the Commer 1500 which had a 1724cc Hillman Hunter or 1795cc Perkins diesel engine (later badged as 'Dodge'), models which lasted through two decades. BMC announced its new J4 10/12 cwt vans in September 1960. These were to be available in both Morris and Austin versions (the only real difference being the style of radiator grille). This model featured a 160-cu-ft body, a car-style independent suspension and the 1489cc engine produced 42bhp at 4,000rpm. These vans ruled the roost until 1965 when the introduction of the Ford Transit created a new landmark in small commercial vehicle design with an engine that was contained in its own separate compartment, fully forward of the cab. The cab interiors offered new levels of quality and comfort to commercial drivers, more in line with what you might expect in a car, and consigning the 'wheeled box' designs to history. In August 1968, until 1970, BLMC adopted a policy of rebranding the larger Austin and Morris vans and light trucks as BMCs. In 1970 the J4 and JU vans became 'Austin-Morris' badged and the 'Leyland' badge was applied to larger vehicles. 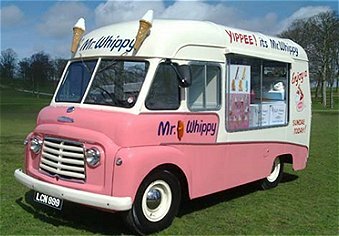 The first ice cream van fitted with 'soft whip' ice cream-making facilities was seen on the streets of West Philadelphia, USA, on St. Patrick's Day 1956, operated by two Irish brothers William and James Conway. Prior to this, soft ice cream was only available in shops. The company was called Mister Softee, and established itself as a well-known brand in America over the next few years. In 1957, on a business trip to America, the director of Smith's Delivery Vehicles saw the potential of bringing the Mister Softee ice cream franchise to his Gateshead factory in the UK. 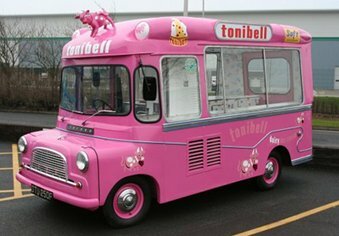 In partnership with the Lyons company, three ice cream vans were built that were first seen at the 1958 Earls Court Commercial Motor Show. Although operating unofficially prior to this date, the official launch of Mister Softee in the UK was in early April 1959, in the area around South West London. 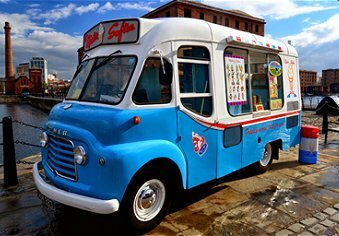 The cost of the first soft ice cream vans were around £3,200, many times more than the old Lyons 'hard' ice cream vans. For comparison, the average UK house price in 1959 was only £2,507. By 1961 Mister Softee had established 35 locations in England and Wales, and Lyons bought out the franchise share held by Smith's Delivery Vehicles, becoming the sole owner of the franchise in the UK. Lyons' main competitor, Wall's ice cream, introduced their own 'soft' ice cream vehicles soon after, under the brand name of 'Mr. Whippy'. 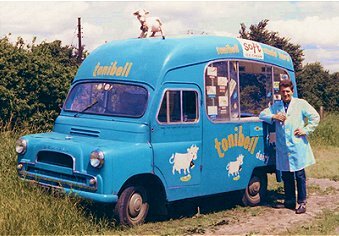 The third of the 'big three' brand leaders of the early to mid-Sixties was Tonibell, who had been operating since the 1950s and also competed in the 'soft ice cream' market, until bought out by Lyons Maid in 1969, and finally fading away in the 1990s. In passing, there is a belief that Margaret Thatcher was somehow involved in the invention and development of soft ice cream. Although she certainly worked in research for Lyons around that time, there is no firm evidence that she directly assisted in its invention. The first omnibus service in the UK was initiated by John Greenwood between Pendleton and Manchester in 1824 although 'stagecoach' services, including local travel, had already been in existence for many years. Greenwood provided the first 'pay and ride' service with 'request' stops en route. The first recorded use of the term 'omnibus' was in France, in 1826. George Shillibeer started the first horse-drawn omnibus service in London, in 1829, which expanded to other major cities over the next few decades and 'double-decker' carriages were introduced in the 1850s. Despite the growth of suburban railway services, horse trams (from 1860) and electric trams (from 1885), horse bus services continued to grow and, by 1900, 3,676 were operating in London alone. Experimental services using steam-driven buses had been tried in the 1830s, but legislation passed in 1861 prevented widespread use until the law changed in 1896. In the year following this change, some experimental motorised services were tried with petrol-driven internal combustion vehicles in various places. 1903 saw the introduction of a bus service in Eastbourne and also one operated by GWR running between Helston and The Lizard. Motorised bus services operated by companies such as BET (The British Electric Traction Company) and the various regional rail concerns led to a major decline in the use of horse buses. In the capital, some of the previous horse bus companies, the LGOC (London General Omnibus Company) and TTL (Thomas Tilling Ltd), introduced motor buses from 1902 and The National Steam Car Company started operating steam bus services in 1909. Over the next five years, BET gradually started to establish itself as a national service provider while LGOC exerted dominance over the London business forcing their major opponents TTL and National to move further afield. National changed its name to The National Omnibus and Transport Company (NOTC). Many smaller local companies were started following World War 1 and, by the end of the 1920s, most of the railway companies had ceased to operate separate bus services, preferring to hold interests in private companies. BET was founded in 1895 and was initially significantly involved in the electrification of British tramways. With the purchase of Brush Electrical Engineering in 1901, it moved into producing its own vehicles, forming a subsidiary motorbus company in 1905. This part of the business became increasingly important as municipal services started to undergo compulsory purchase and it continued to be one of the two major bus groups in the UK until 1967 when it sold off its UK bus interests to the Transport Holding Company, to become part of the National Bus Company in 1968. BET's subsidiary companies included: East Kent, Devon General, Potteries, Ribble, Southdown, East Yorkshire, Midland Red, The City of Oxford Motor Services and Yorkshire Traction. The latter company included Mexborough and Swinton who were the last company-owned operator of trolleybuses in the UK. TTL and BET combined to form the Tilling & British Automobile Traction Company (TBATC) in 1928. The new company was a separate concern from BET and continued to acquire interests in many other smaller operators. Meanwhile, NOTC transferred their operations to Eastern National, Southern National and Western National, all of which were jointly-owned by railway companies. The Road Traffic Act 1930 applied some regulation to bus services, eliminating many small operators and significantly reducing competition between the various services. TBAT acquired the NOTC services in 1931 to leave the 'big three' (Tilling, BET and TBAT) - who were all essentially part of the same 'group' - with most of the transport power in England, while Scotland was dominated by SMT (Scottish Motor Traction). In 1933, control of bus operations within a radius of approximately 30 miles of London were compulsorily transferred to the newly-formed London Passenger Transport Board, effectively 'nationalising' bus services in the London area. TBAT was wound up during the Second World War, in 1942, with all its acquired companies being transferred to TTL. Nationalisation was pursued by the post-war Labour government who, with the passing of the Transport Act 1947, created the British Transport Commission and acquired the operations of TTL, SMT and a large independent concern called Red & White. With the nationalisation of the railways, the BTC also acquired interests in many of BET's companies, but BET was not actually forced to yield its services to nationalisation at that time. Between the late 1930s and the beginning of the Sixties London had the biggest trolleybus network in the world. They had a top speed of 30mph, needed little maintenance and drew their power from wires hanging above the street, but there was a tendency for the collecting poles, the 'trollies', to spring off the wires, necessitating realignment by the bus staff with the help of long bamboo poles. By the 1950s buses were increasingly looking like a much more flexible, although more expensive, option due to the constant changing of roadway access routes and introduction of one-way systems so, in 1954, London Transport announced that all trolleybuses would be replaced by a new diesel bus, the AEC Routemaster. The progressive withdrawal from around the London network started in 1959 and took place over several years. The last service in the City of London, operating out of the Moorgate and Holborn termini, closed in November 1961 and the final trolleybus journeys took place on 8th May 1962. In 1962 the BTC bus companies were transferred to the Transport Holding Company, to which BET sold all its UK bus companies following the Transport Act 1968, resulting in nearly all of the UK bus service industry being owned either directly by the government or by municipalities. The Transport Act 1968 was intended to rationalise the publicly owned transport services and create a framework wherein subsidies provided support for uneconomic but necessary services. English and Welsh bus companies in the Transport Holding Company were transferred to the new National Bus Company, country services provided by London Transport were transferred to the NBC, THC Scottish companies were transferred to the Scottish Transport Group and the municipal bus services in 5 other metropolitan areas outside of London, including some companies operated by THC in those areas, were transferred to the new Passenger Transport Executives. By the early 1960s London was experiencing increasing problems caused by both traffic congestion and the difficulty of recruiting sufficient staff to operate all their services. In preparation for a possible experimental service to be carried out in central London the LTE ordered 33 front entrance Leyland Atlantean buses, suitable for one man operation, towards the end of 1962. Six 'standee' buses were also ordered. However, when the London Transport Board replaced the LTE on 1st January 1963, they immediately entered into talks with the unions about service reforms that resulted in the unions making counter-claims and banning overtime and rest day working. c) The introduction of 'standee' services (as originally recommended by the Chambers Committee in 1953) with flat fares and automatic fare collecting equipment. The first central London 'standee operation, called the 'Red Arrow' service, was introduced on 18th April 1966 using rear-engined 36 ft AEC Swifts that had standing room for 48 passengers and seating for 25. Passengers entered at the front and paid a flat fare of sixpence (2.5p) into coin-operated turnstiles called 'passimeters'. The Swift was a 33' rear-engined single-deck bus (built by AEC between 1964 and 1974) that was also available in a 36' length version referred to as a 'Merlin'. Its design was considered to be suited to driver-only operation and was the favoured alternative to the traditional double-deckers operated by a driver and a conductor as British legislation prevented driver-only operation of double-decker buses until the late 1960s. The largest fleet of Swifts was operated by London Transport and London Country, with over 1500 in total delivered between 1966 and 1972. The 'Red Arrow' experiment was carried out fairly successfully in central London so, on 14th September 1966, the full Reshaping Plan was finally announced, initiating an attempt to introduce major route re-organisation and operational changes throughout the network. However, the public in general disliked the changes and, with the Merlins eventually proving to be unsuitable, the plan had been largely abandoned by 1973. Workers building the Victoria Line in the 1960s. When she opened the line in 1969. There have been a number of schemes to bring monorails to London, including one suggested in 1967 by the GLC Department of Highways and Transportation that proposed a monorail service to run along Regent Street and Piccadilly.